We arrived in Tokyo late at night on Saturday, so Sunday was our first full day in Japan. 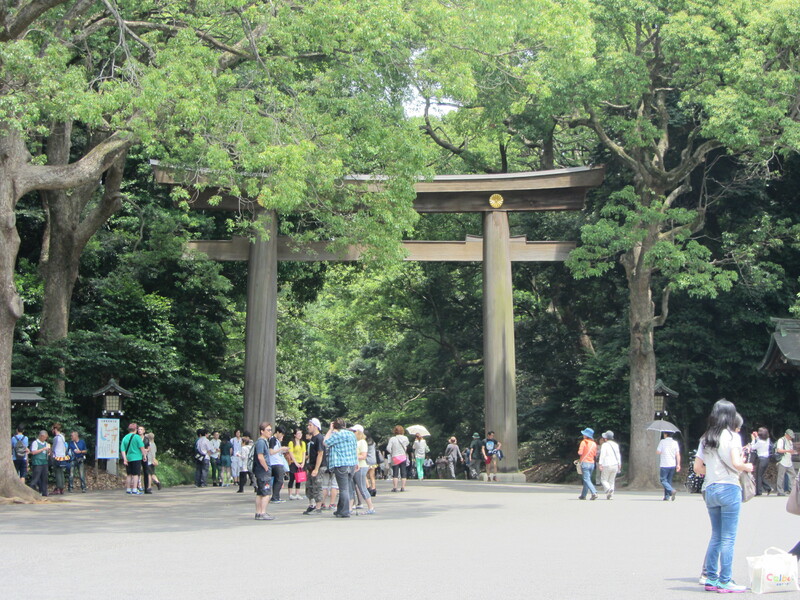 Because it was a free day, four of us decided to go on a tour of Meiji Jingu organized by our hotel. 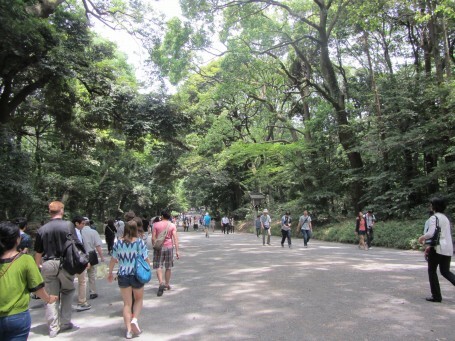 Meiji Jingu, or Meiji Shrine, is a large forested area located right next to Harajuku Station. It’s bustling with tourists and, according to our guides, boasts the largest torii, or gates, in all of Japan. We walked along a wide muggy path overhung with deep green trees, stopping along the way so our guides could tell us more about this Shinto shrine. Something they told us that stuck with me was that visitors to the shrine are supposed to walk on the sides of the path because the center is where the gods pass. 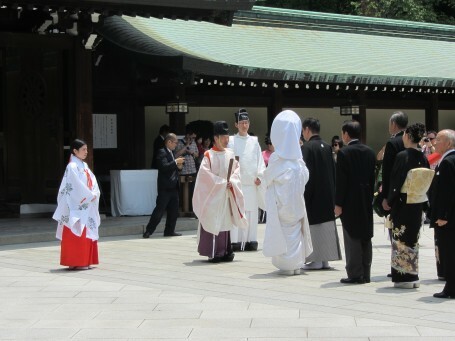 After about ten minutes we came to the center of the shrine, the main building complex. Before entering, we purified ourselves at the fountain outside. Then we came into the courtyard and prayed at an offering box. There were a few wedding ceremonies occurring at the shrine while we were there, so we caught a glimpse of a beautiful traditional wedding. 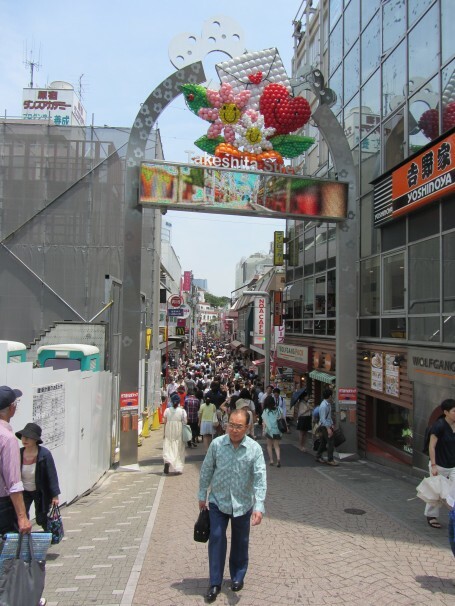 After leaving Meiji Shrine, we walked through commercial Harajuku, including the famous Takeshita Dori, or Takeshita Street. True to its reputation, Harajuku is indeed a shopping haven filled with young people making bold fashion statements. From the boutiques lining small pedestrian-only streets to the huge retail stores extending along boulevards, crowds of locals and tourists alike ambled along, purchases in hand and looking fantastic. The restaurant at which we ate lunch was in a quieter part of Harajuku and seemed like a hole-in-the-wall sort of deal, up some stairs and behind some buildings. 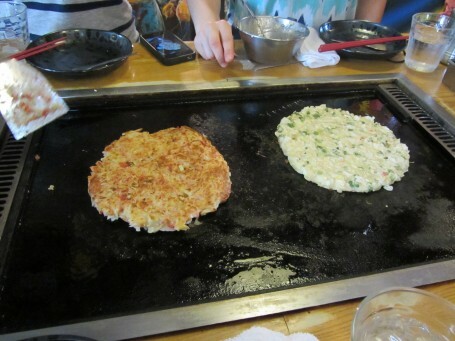 We cooked our own okonomiyaki and monjayaki! I had never eaten either before, and I am pleased to say that both were completely delicious. Unfortunately, I don’t think any of us caught the name of the restaurant (though its location is pretty memorable); but between the delicious cook-it-yourself offerings and the modern art all over the walls, this restaurant had an upbeat, trendy atmosphere that perfectly encapsulated the spirit of Harajuku youth culture. We set out again shortly after returning to the hotel to go to Akihabara, this time with most of our class. Once again we took the subway to get there. 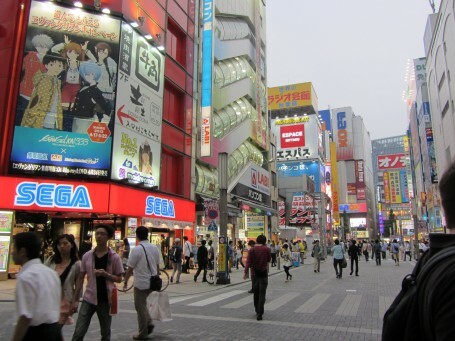 Akihabara is famous for being an electronics hub as well as an otaku mecca. Customers meandered through stores like Yodobashi Camera to buy, well, more than just cameras, and hung out in arcades playing crane games and video games alike. We decided on a revolving sushi bar for dinner, and on the way there we passed electronics advertisements, maid cafes, and racks upon racks of DVDs. Akihabara is chaotic, but there’s a lot to do and a lot to see, and I want to win something at an arcade too! Our first day in Tokyo was a long one and we all were exhausted by the end of it; as Sally remarked during the trek home, “It feels like we’ve been here a month already.” It’s hard to believe that we’ll be exploring and learning something new like this every day for the next few weeks, but it’s a really exciting prospect too! I went to bed that night already anticipating what the next day would bring.